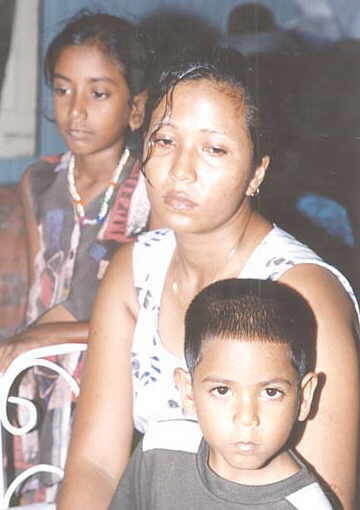 WORRIED: kidnap victim Kamaldeo Ganesh's wife, Sonita Godette with their two children Annie, 8 years, and Ajay, 4. AS THE search continued yesterday for kidnap victim Kamaldeo `Golo' Ganesh, 27, of Bladen Hall, East Coast Demerara, his relatives feared he is dead. The young father was kidnapped Wednesday night and up to late last night there was no sign of him, relatives said. They said there were rumours that Ganesh had been killed and his body dumped somewhere in Buxton, also on the East Coast, but there were no confirmed reports of his death. A mournful crowd of relatives and friends yesterday gathered at his home hoping that with assistance from the Police and Army, who went on a search, they would have found him. However, they were unable to find any trace of Ganesh. Police Commissioner Floyd McDonald told a news conference yesterday that Police were looking for a woman to assist with the investigations into the kidnapping of Ganesh. THE body of kidnap victim, Kamaldeo 'Golo' Ganesh, 27, of Bladen Hall, East Coast Demerara, who went missing Wednesday night, was recovered yesterday, Police said. It was found around 07:00 hrs about two miles aback of Buxton, East Coast Demerara, in the vicinity of the Church of God road, Police said in a press release. Ganesh's black Night Hawk motorcycle, licence number CD 3939, which he left home with on the night he was kidnapped, was also found about 20 metres south of his body, Police said. Relatives who went to identify the body, said it was partly decomposed and had what appeared to be several gunshot wounds in the back, and at the back of his head. Someone on Wednesday night made contact with Ganesh's relatives by telephone and demanded a ransom and they were instructed to take it within 15 minutes to the Buxton Side Line Dam and the railway embankment. His wife, Sonita Godette, said the person with whom she spoke instructed her to hand over the money to someone who would have been waiting there to collect it. However, the victim's relatives were unable to meet the demand, (an undisclosed amount) because it was difficult to acquire the money they were asking for in such a short time, Godette explained. The caller also instructed that the matter should not be reported to the Police. Following reports of the kidnapping, relatives began to conduct a search for Ganesh with assistance from the Police and the Army. Police and Army ranks carried out a search on Friday, in the Buxton Backdam area but did not find any trace of Ganesh. A mournful crowd of relatives and friends gathered on Friday at the victim's home hoping that the Police and Army, who went on a search, would have found him. Police Commissioner Floyd McDonald told a news conference Friday that Police were looking for a woman to assist with the investigations into the kidnapping of Ganesh. Godette said that her husband on Wednesday, around 18:00 hrs, went on his usual evening ride down the railway embankment road on his motorcycle. She said that about an hour later, an unidentified person called her on her husband's cell phone, demanding a ransom for his release. She said that in one instance the person put her husband to speak on the phone and he related that he was about to die. "He said, me half dead and dem gon kill me, dem gon carry me way now and dem gon kill me, see wah all yuh could do. He start cry and then somebody tek way the phone and said `all yuh get de money?'" The wife said that during the telephone conversation she remembered hearing noises in the background, which sounded as if they were beating her husband. Asked whether her husband's kidnappers had disclosed their location, she said they told her they were in the Vryheids Lust backdam, also on the East Coast. Kamaldeo's mother, Chandra Ganesh, who operates a stall at the Stabroek Market in Georgetown where she sells cloth, said he assists her with the business and after work in the afternoon he would usually go for a ride down the railway embankment road up to Buxton and return. She recalled that shortly before her son left to go for the ride Wednesday, a woman had called for him on the telephone. In apparent response to that call he went off, but returned shortly after, she recalled. He went out again shortly after, she said, but never returned.